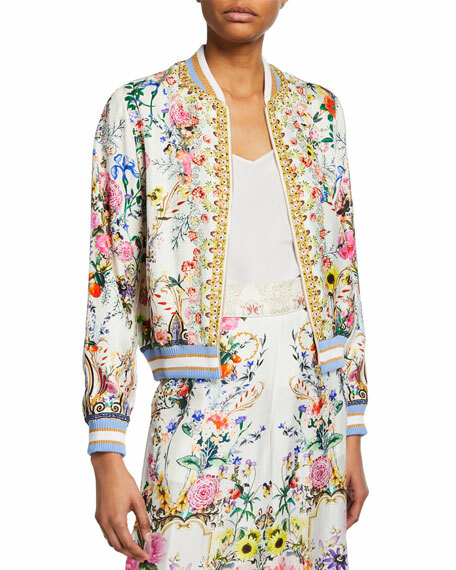 The bomber jacket, an essential cut carried season to season, is embellished with embroidered floral appliqués down the chest and along the back. 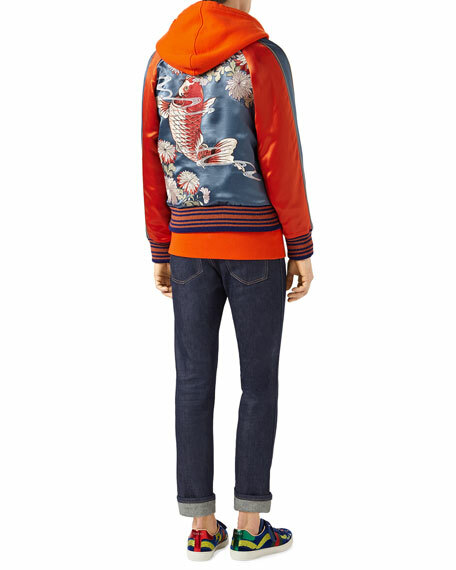 The back is further enriched with a large embroidered Koi fish, an image often associated with good fortune, abundance and courage. 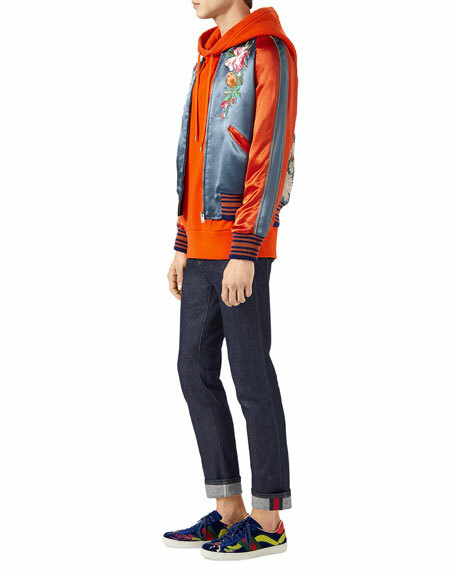 Blue acetate with orange sleeves. Embroidered flowers and fish appliqués. Satin insert with braided cord along the sleeves. For in-store inquiries, use sku #2213491. A.L.C. 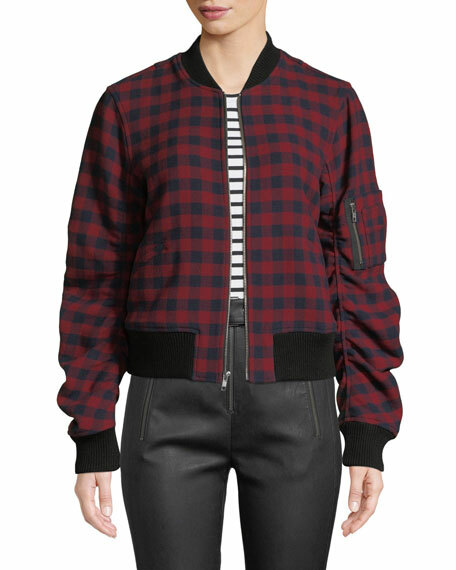 "Andrew" plaid bomber jacket. Rib-knit contrast neck, cuffs, and hem. Baseball collar; zip front. Long sleeves. Side slip pockets. Relaxed fit. Virgin wool. Dry clean. Imported. 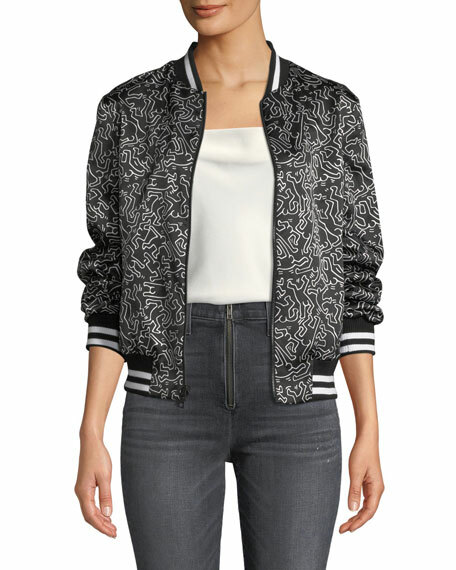 Keith Haring x Alice + Olivia "Lonnie" reversible bomber jacket in silk. Striped, rib-knit neck, cuffs, and hem. Baseball collar; zip front. Long sleeves. Relaxed fit. Combo 1, silk; combo 2, cotton/spandex. Polyester/spandex lining. Dry clean. Imported. 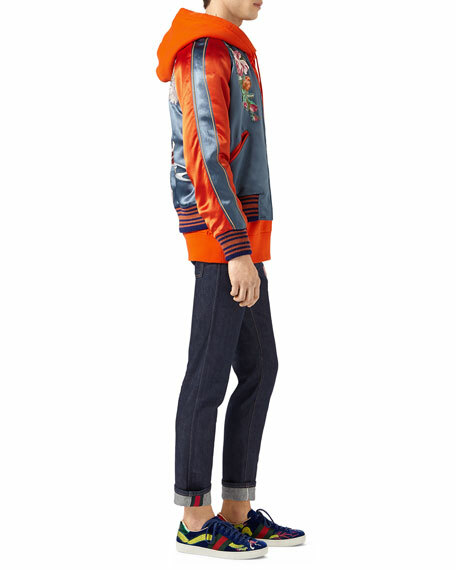 ALICE + OLIVIA JEANS "Lonnie" reversible bomber jacket. Striped, rib-knit neck, cuffs, and hem. Baseball collar; zip front. Long sleeves. Side slip pockets. Relaxed fit. Polyester; combo 1, polyester; combo 2, cotton/spandex. Polyester lining. Imported. 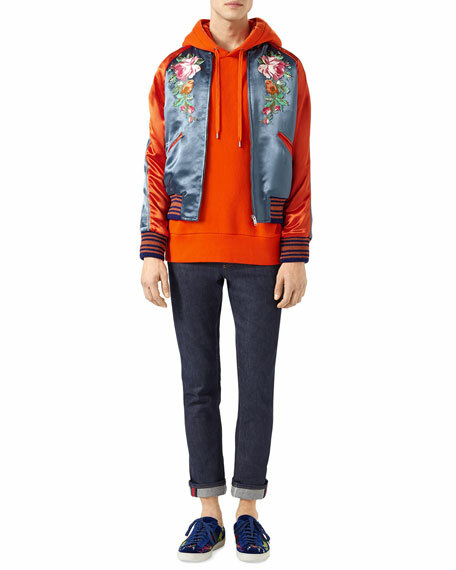 Camilla bomber jacket in Boheme floral-print with crystal embellishments. Striped rib-knit neck, cuffs, and hem. Baseball collar; zip front. Long sleeves. Side slip pockets. Relaxed fit. Silk main & lining. Imported.